We envision a time when all public schools welcome and successfully educate all students, regardless of their abilities or background. In order to achieve this goal, we empower NYC charter schools to develop high quality inclusive educational environments by providing professional development opportunities, resources, school-based guidance and access to local and national best practices and renowned special populations’ experts. 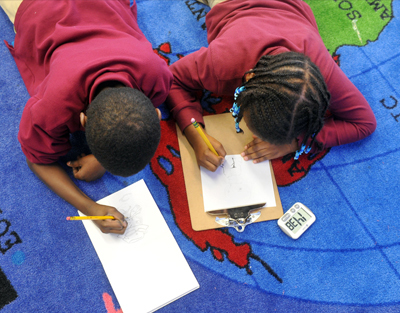 In 2011, the New York City Charter School Center merged a consortium of borough-based special education cooperatives into a citywide membership program. The NYC Special Education Collaborative now serves 190 NYC public charter schools, providing access to professional development, expert technical assistance and advocacy in support of schools’ efforts to provide high quality education to their special populations. When we began, our work centered around the basics of ensuring compliant programs. Over the years – and in response to schools’ commitment and progress – our programming evolved and expanded to include supports and partnerships that grow the inclusive mindset, engender best instructional practices, and ensure favorable public policies and practices. We’ve also expanded the focus to include English Language Learners and issues such as equity, social emotional learning, and culturally responsive teaching. More than 80% of the sector, or 190 charter campuses, are members of the NYC Special Education Collaborative. The Collaborative offers over 130 professional development workshops, trainings, conferences and webinars annually. More than 2,200 educators, leaders and coaches attend the Collaborative’s programs each year. The Collaborative team spends approximately 450 hours in schools each year, conducting classroom observations and providing one-on-one consultations. The Collaborative has certified over 900 educators in crisis prevention. The five Collaborative team members have a combined 49 years of experience in teaching special populations and leading school-based support programs. NYC Special Education Collaborative founded to support schools’ compliance-related needs. Developed differentiated supports through tiered levels of membership. Offered approximately 30 workshops a year. Team grew to enable school-based observations and consultations. Programs shift to supporting instruction and school-wide culture. Mission revised to focus on inclusive education. Brought small group of NYC charterss to visit inclusive schools across the country (LA and Boston). Advocacy resulted in $7.5M in support of Committees on Special Education for charters. Offered nearly 80 workshops a year, including new in-school workshops for teaching staff. Hired an ELL Specialist to offered compliance guidance. Collaborative expands programming to include ELL supports and social emotional workshops. Established communities of practice for high schools and counseling staff. Launched a Leadership Coalition for Special Populations. Focus has shifted to equity and culturally responsive teaching. Doubled the offerings and fully integrated ELL programming into the Collaborative schedule. Over 100 PD opportunities already planned for the year.